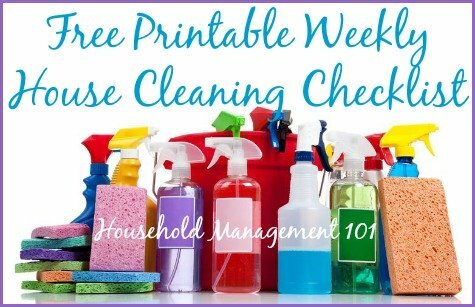 Check out this weekly checklist for house cleaning and other weekly chores for ideas if you are struggling to figure out what needs to be cleaned in your house on a weekly basis. First, this list is a bit comprehensive and not all parts of it will apply to your family. Take those parts that help and ignore the rest. Please note that the printable version is available below, so scroll down to find it! Second, I do not suggest attempting to tackle everything on this list all at once on one day of the week. Instead, I suggest you follow a weekly house cleaning schedule and weekly laundry schedule. When you do this you can spread the tasks out to be done in more manageable chunks of time. Use this checklist to help you identify any missing pieces you might have in your list of weekly chores to make sure you are not forgetting anything major, or to give you inspiration on what to include on your own schedule. If you want additional inspiration check out these real life examples of other visitors cleaning schedules. You can also share your own weekly house cleaning schedule here. Doing these weekly cleaning tasks will be easier if you also follow a daily house cleaning schedule. 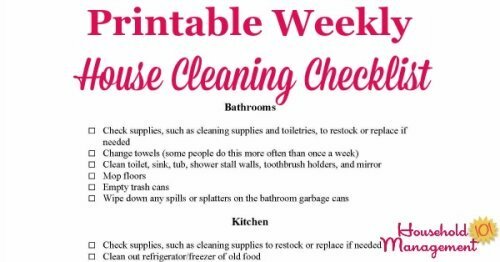 Once you have decided on your own weekly checklist for house cleaning place a copy in your home management binder for future reference.